As shown on ITV Alan Titchmarsh Show! 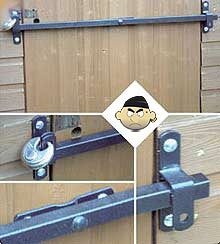 Secure steel lock with steel fixing plates - prevents your shed door from being forced open. Available in a range of widths. The new Adjustable Shed Bar 1800mm is suitable for shed doors between 1200mm-1800mm wide. Its adjustable width means that you can fix it to the most secure points around your shed door, within range of the shed bar.